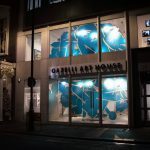 Gazelli Art House is excited to announce that Luca Serasini’s The Káos of Cosmos will be taking over the gallery windows as the winner of the Window Project Winter 2017. 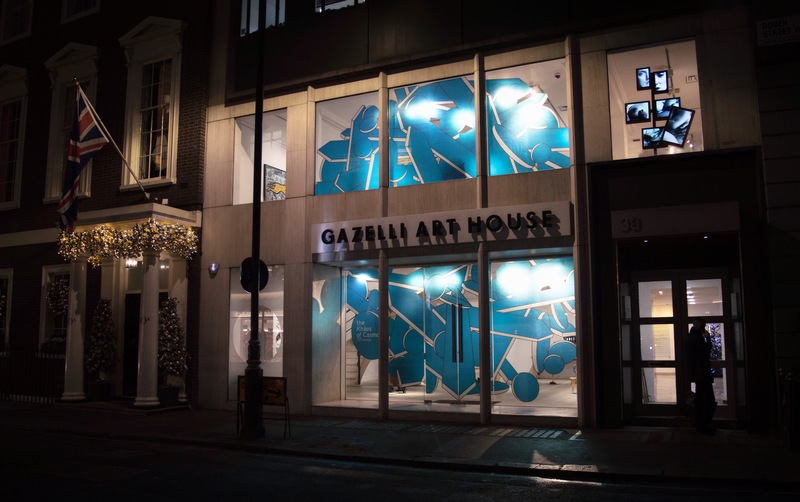 For his site-specific light installation on the gallery’s façade, Serasini presents the latest chapter to his on-going series of work, Progetto Costellazioni, dedicated to stars and constellations. The Káos of Cosmos presents the Universe from another cosmological phase, representing a “particular waiting moment, full of power, of sentiment, but also a moment of potential energy, ready to explode”, Serasini comments. Disk-shaped stars are symbolically placed on the surface of the window, connected by lines to compose the primordial egg anticipating the creation of the Universe. The installation invites the viewer to not only see again what has been forgotten, but to reflect on such forgetfulness. “There is nothing more globalised than the sky in the night. Do we really need the stars? Or they are like ancient cults of forgotten gods, overtaken, buried by new cults and new gods? Only in empty spaces, as the desert or the sea, it is perhaps still possible to feel their presence,” the artist reflects. The panel invited to judge the Window Project Winter 2017 consisted of James Putnam (an independent curator and writer) and Serra Grantay Avcioglu (co-founder of Art Junction).